Coffee mugs are a terrific gift item ... 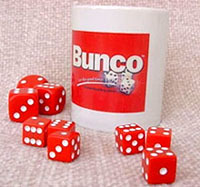 Fill it with the Party Bunco beverage, or morning wake me up brew, or that hot evening drink ... this official Bunco mug is great. Made of heavy ceramic approximately 4" tall. Group ordering of 12 mugs will be 20% discount.